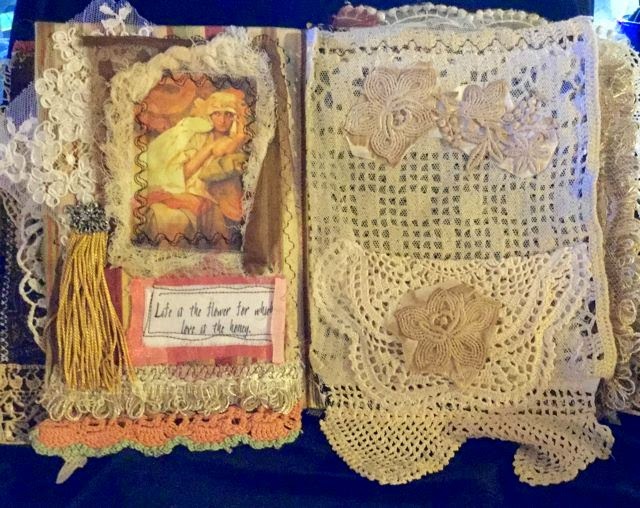 Well, it's been almost two years since I started this Lacy Prayer Book! 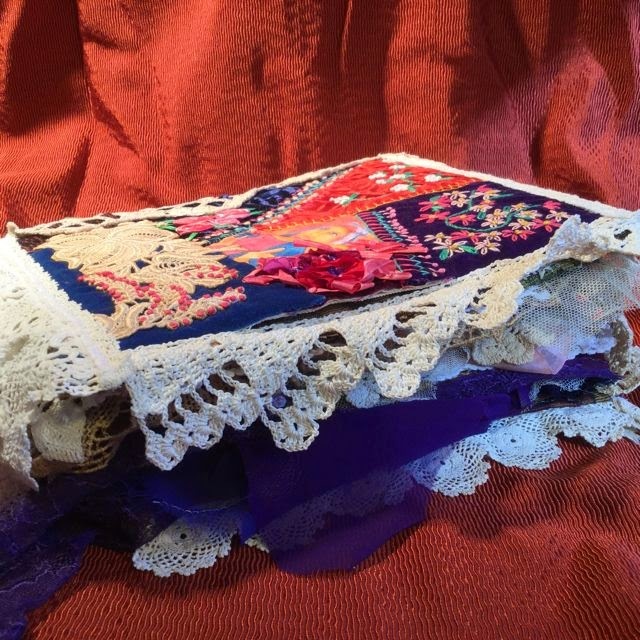 Each of the foundation pages are made from lovely designer tapestry fabrics, totally turned inside with no raw seams. 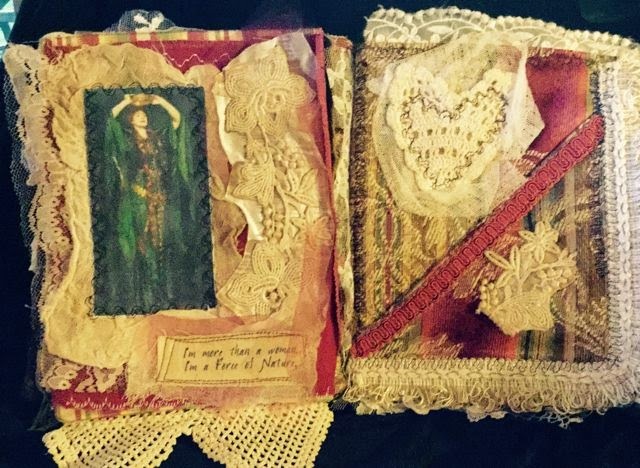 The book measures about 9x10" and is 4" thick! FOR SALE IN MY ETSY SHOP. 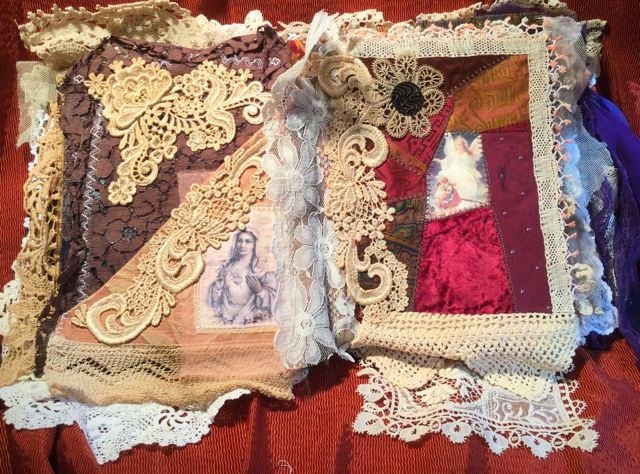 The cover is a crazy quilted patchwork of velvets and silks, with many hand made crazy stitched embellishments, including some lovely silk embroidered flowers. 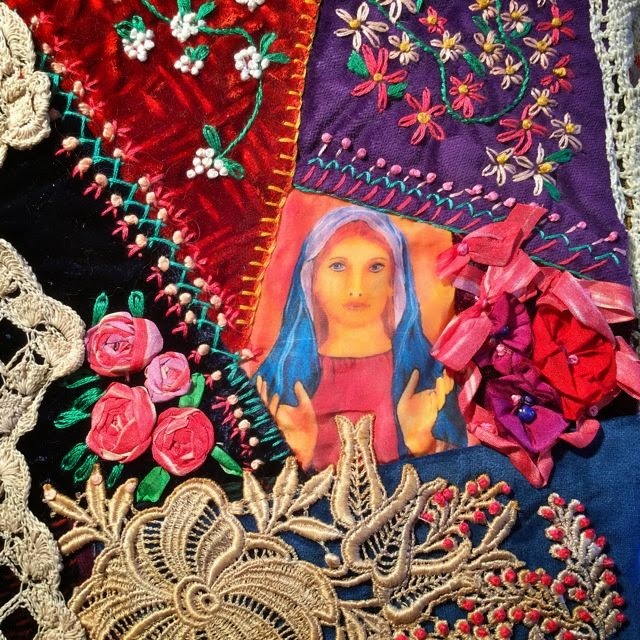 The Blessed Mary is from one of my original paintings, printed on silk. She seems to reach right out to you. 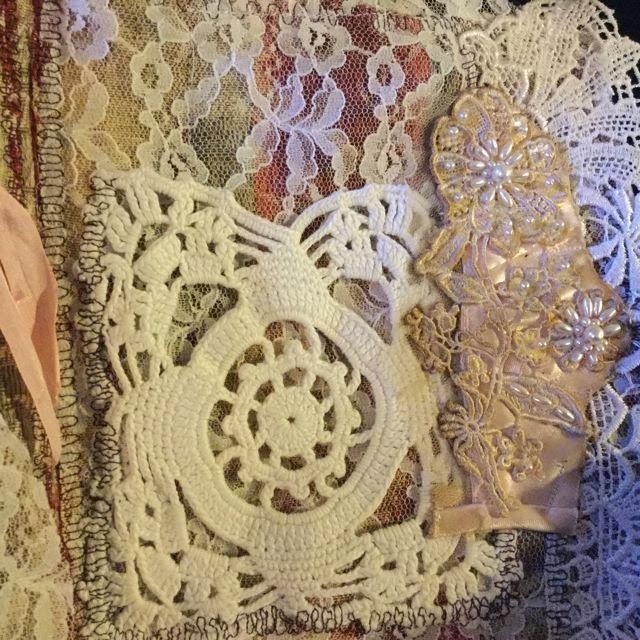 Lots of beautiful vintage laces have been stitched on, including this 1890's lady's collar. 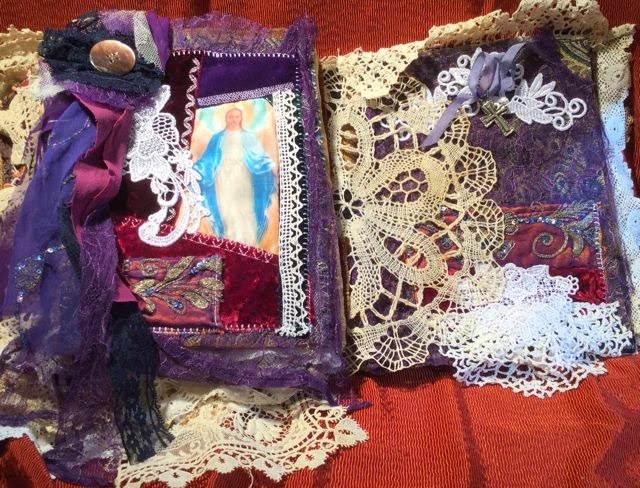 The first two inside pages.... both have pockets to tuck in your prayers. 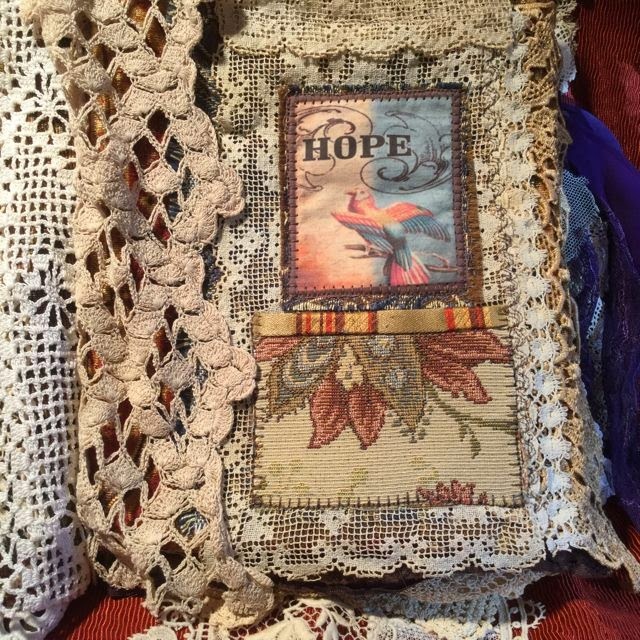 Believe and Hope are the themes here. 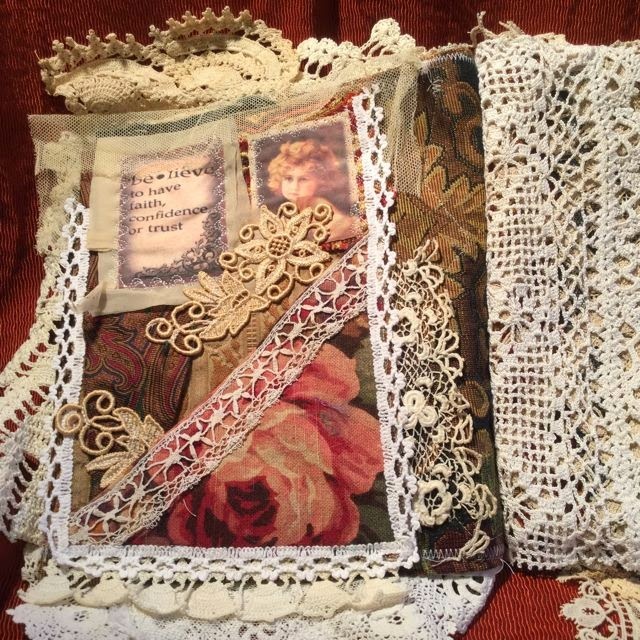 Includes many layers of vintage crochet, tatting, handmade laces. 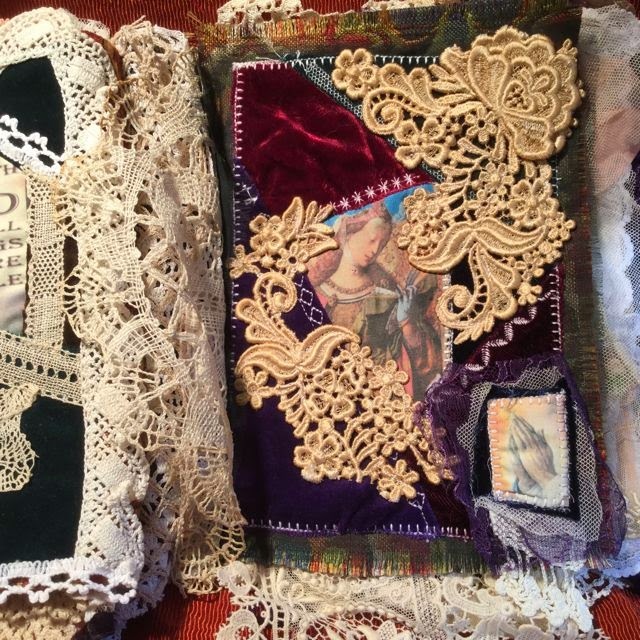 And a bit more tapestry fabric. 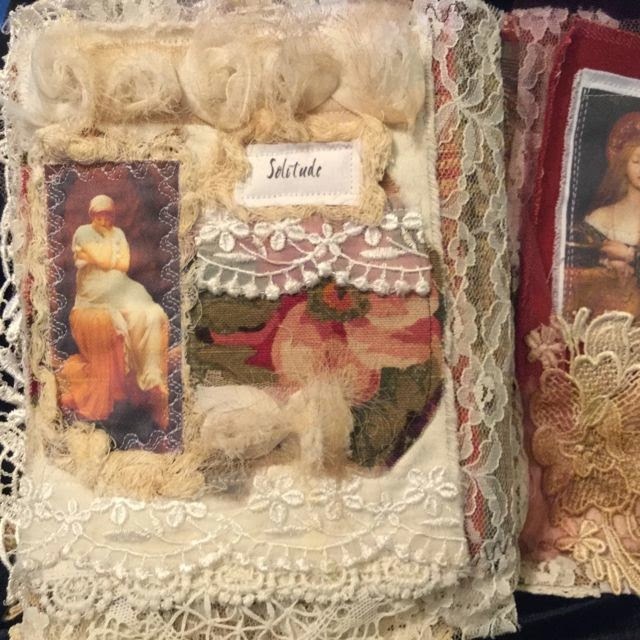 Images are all on silk. 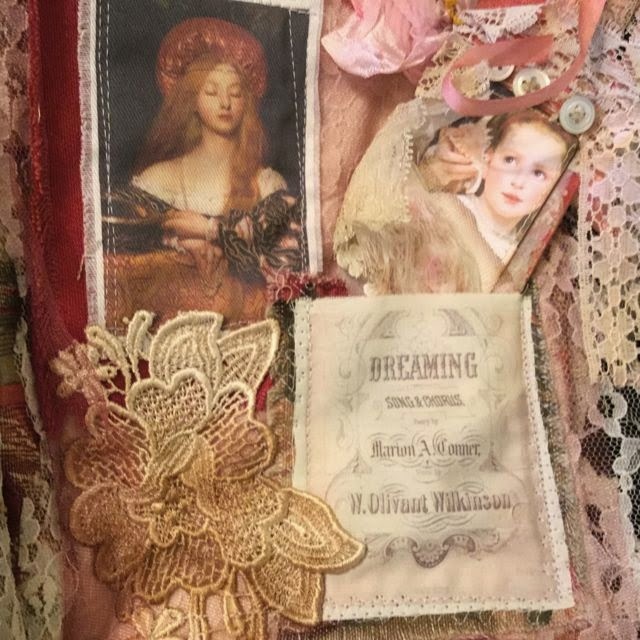 The next two page spread features a vintage image of Mother Mary printed on silk, some hand dyed wedding laces, a 1890's glass button, and more crazy quilted silks and velvets. There is a sizable pocket on the left page. 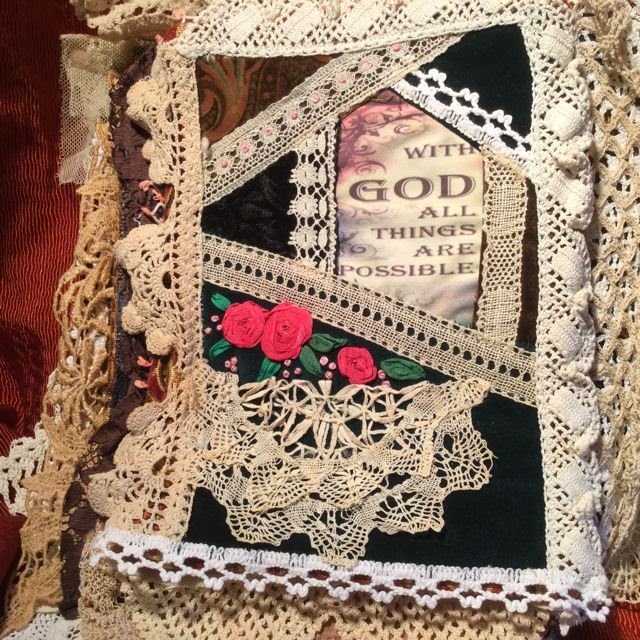 With God, All things are Possible is the prayerful theme of the next two page layout. 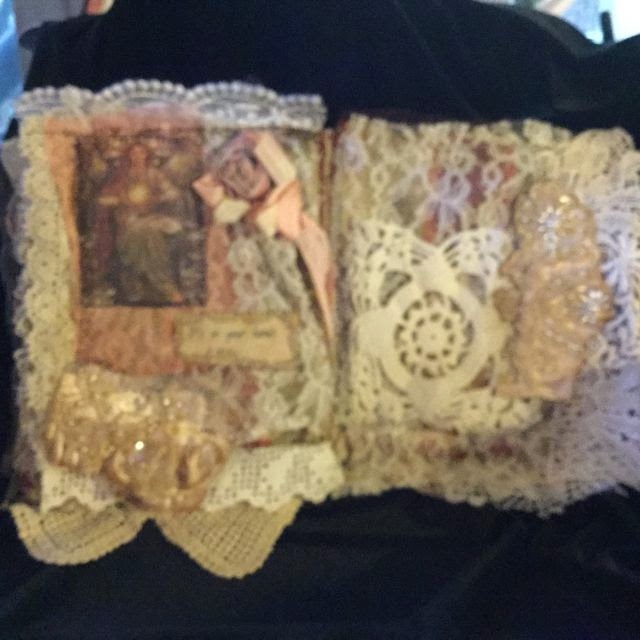 You'll notice some petite pink silk flowers just above the tiny doily pocket (on the left). 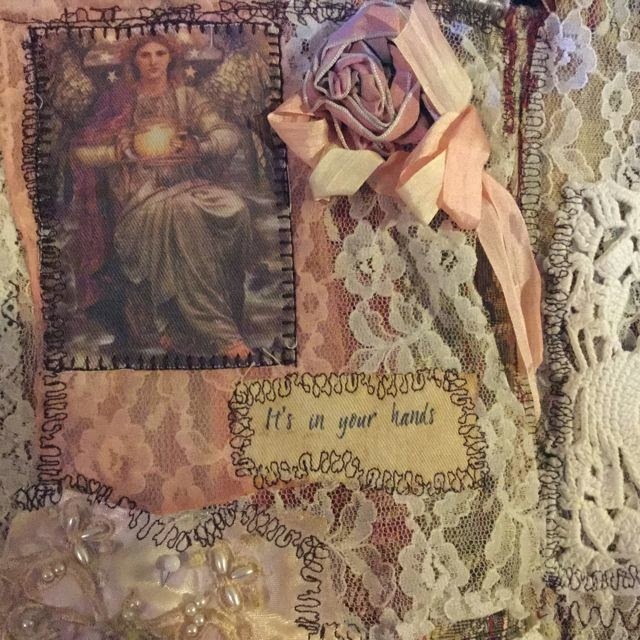 The right side is also embellished with more hand dyed laces, as well as a vintage angel and prayerful hands printed on silk. 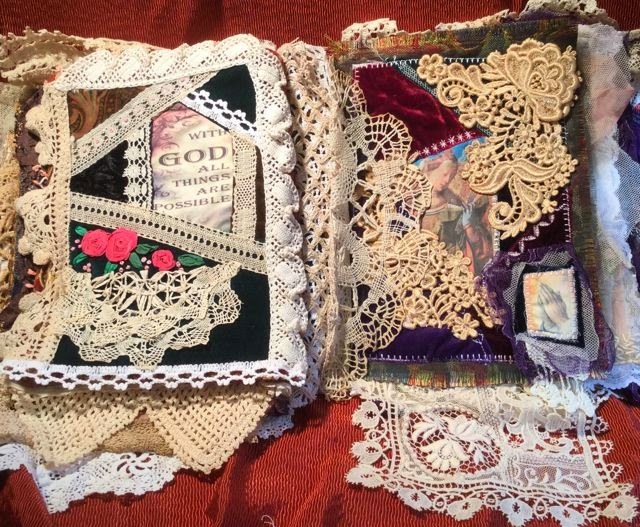 A sampling of crazy quilt stitches done in white accents this page. 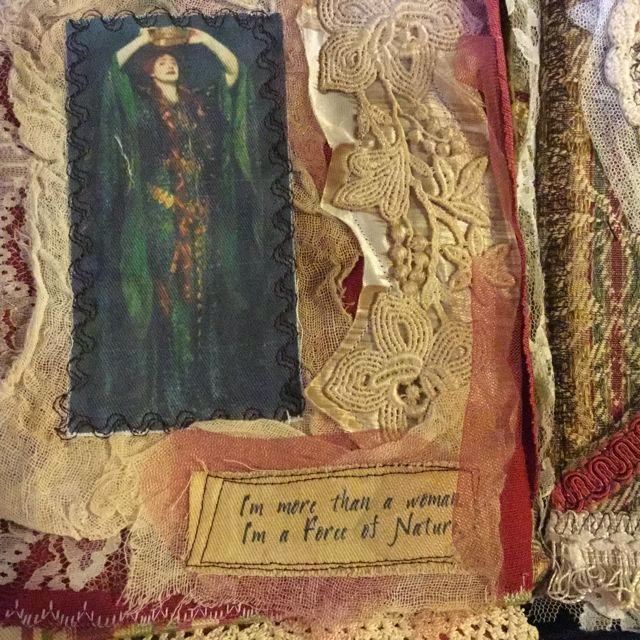 These two pages are perhaps my favorites! 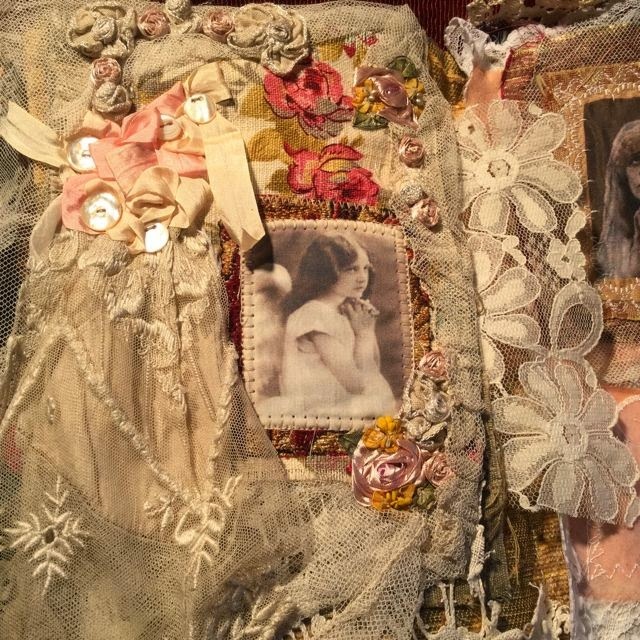 The rosettes you see are from the 1915 estate of a dressmaker. I've saved these flowers for years, and finally made the decision to include them here. 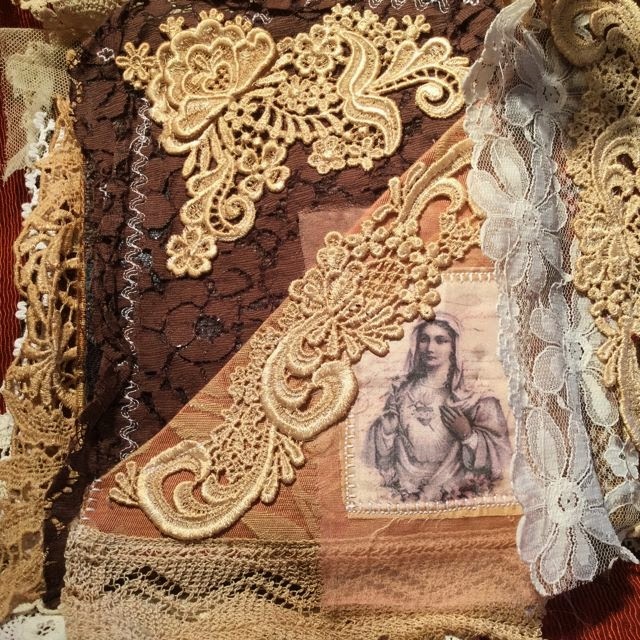 You'll notice the vintage wedding dress netting as well as a snippet of ecru colored silk and netting from the dress. 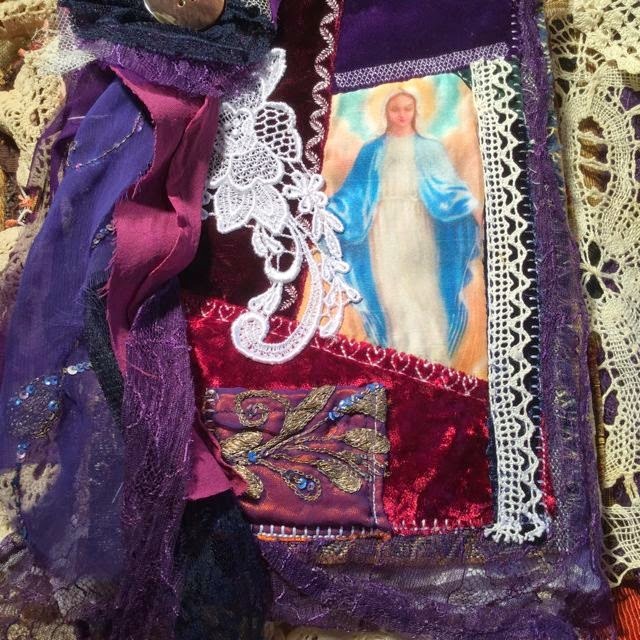 Both praying images are printed on silk. 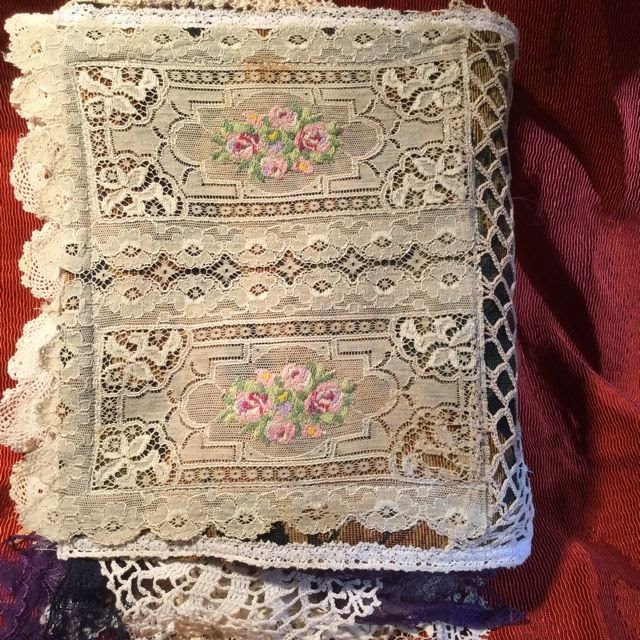 This closeup of the right side page shows you the vintage organza lace from a baptism dress, forming the good size pocket. Also, you'll note the sweet crochet cup shaped pocket. I think this was actually one of those crochet coasters that would wrap around your glass of lemonade. It's perfect to hold a small memento. The last two pages are a deep purpe and blue. 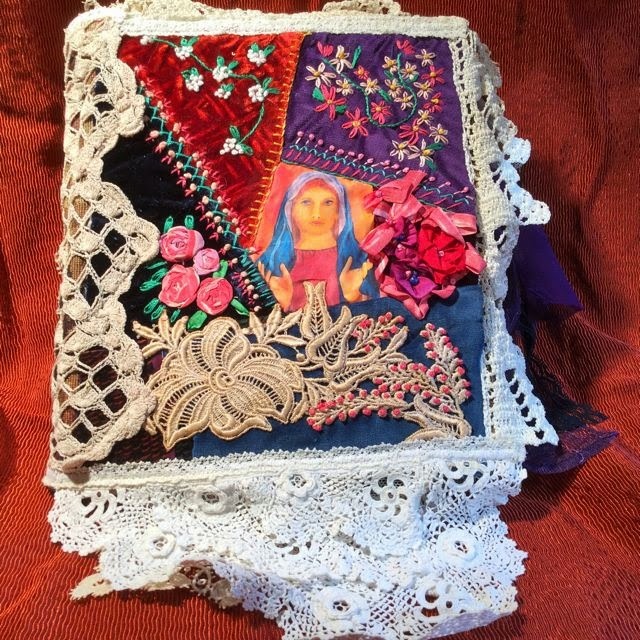 A Holy Card of Mother Mary printed on silk and a tiny pocket made from a vintage dress embellish this page. 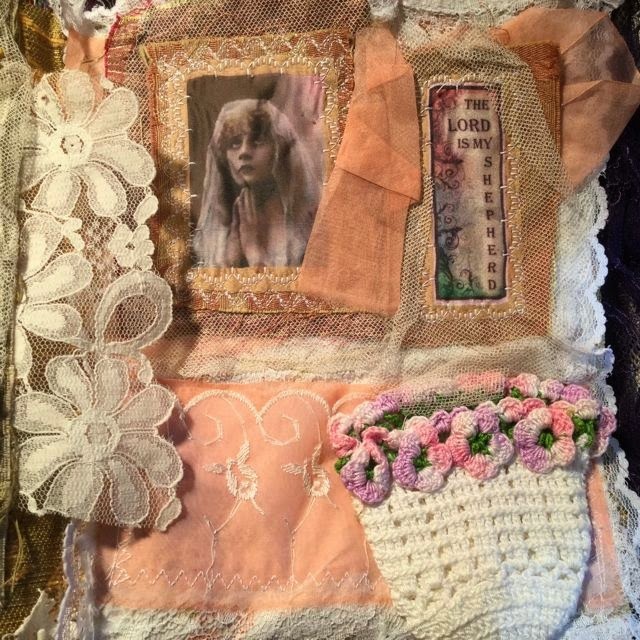 The button flower on the upper left was made from soft silks, lace, and ribbons rescued from the purple vintage dress. (I used several snippets from that dress!) 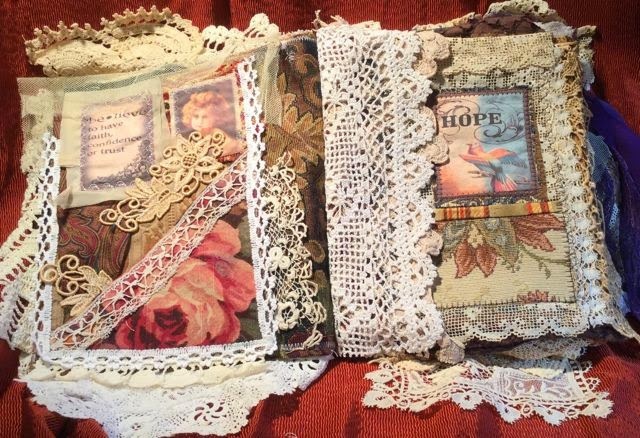 Between the two pages you'll find an exquisite crochet doily. 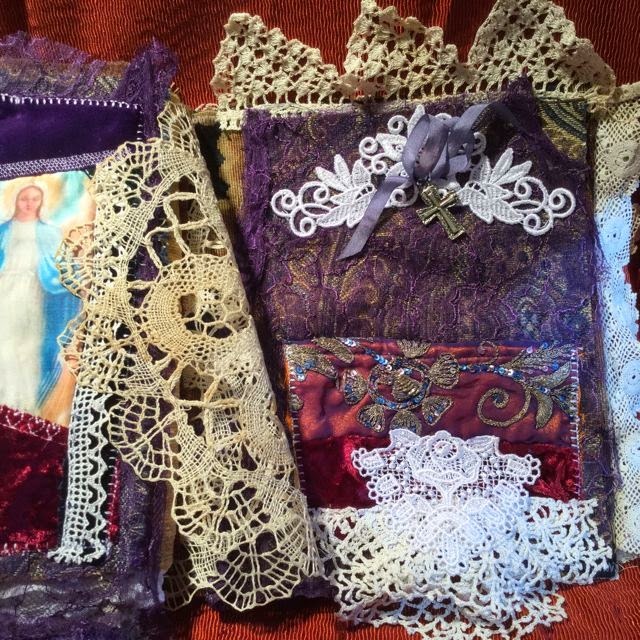 On the right youll notice a vintage cross hanging from a lavender silk ribbon, as well as another good sized pocket designed from the vintage dress. 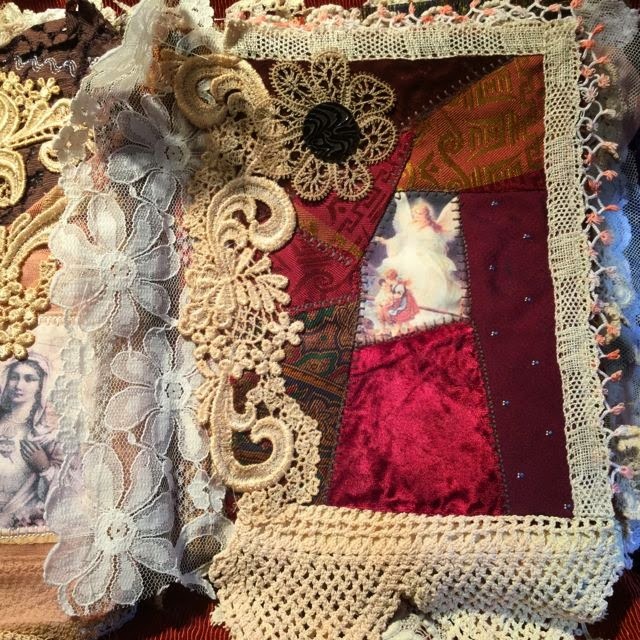 The back cover is a sweet section of a vintage table doily. It truly measures a generous 4 inches thick! Dripping with layers of laces, silks, and embellishments. Thank you for looking and Sweet Blessings to you. 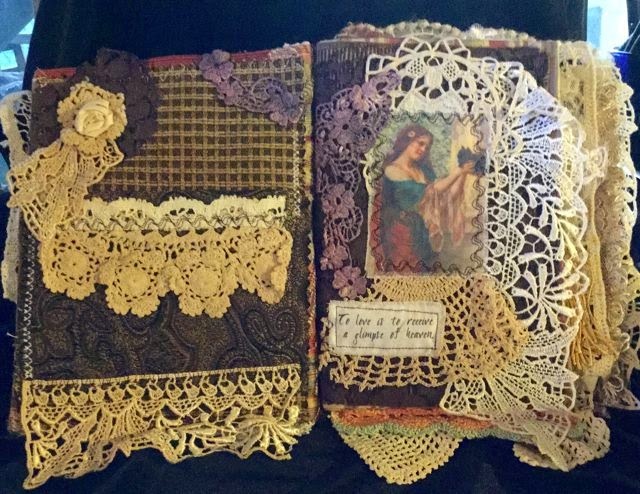 For your enjoyment... A Lace Book now available in my ETSY SHOP. 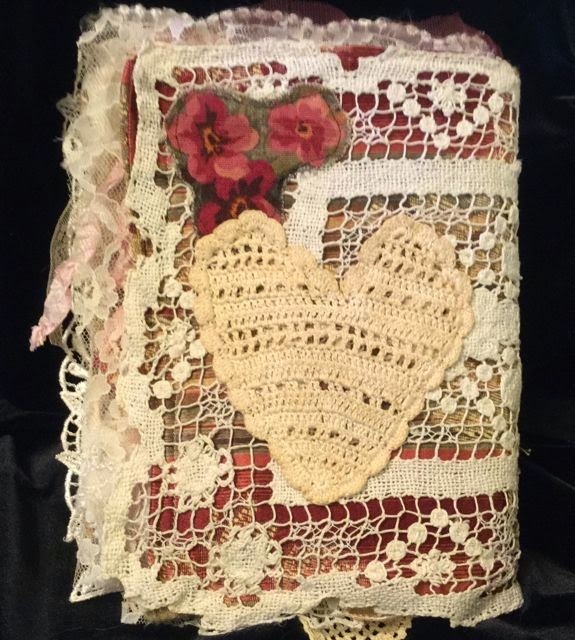 Front cover with layers of crochet lace doiley, roses, silk flower and just a touch of bling. 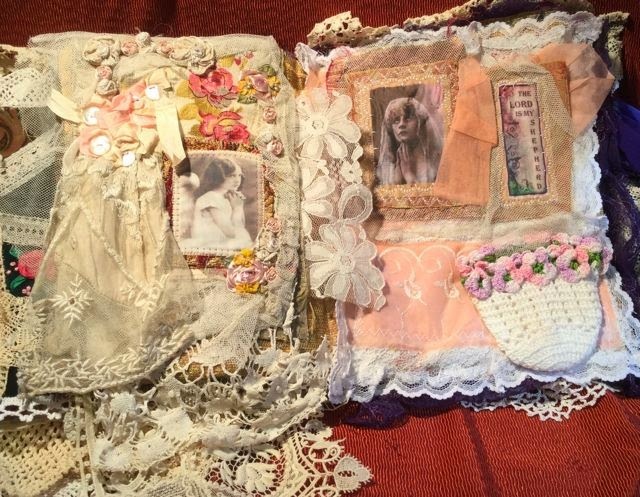 Inside front pages...layers of lace, sweet rosette flower, designer fabric samples, a pocket on the left side, "To love is to receive a glimpse of heaven." quote on the right side. Lovely vintage painting has been printed on cotton twill. 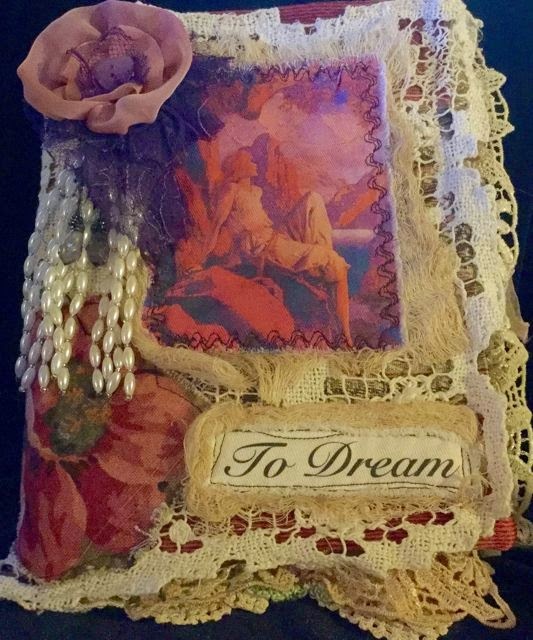 EVERY set of two pages supports a pocket for you to tuck in tags, messages, sweet thoughts. Sorry, this one is blurry... I've included a better closeup below.